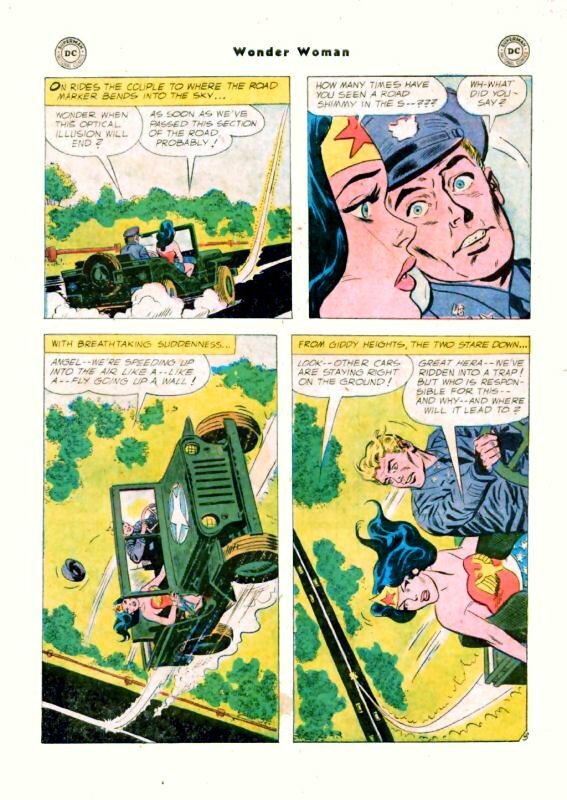 Steve Trevor picks up Wonder Woman to take her out on a date for her birthday. When he picks her up in his jeep they drive off to their destination and along the way she kisses him. Steve brags about how he could tell Wonder Woman simply by her kiss, because it is one in a million. Just then they are shocked when the line in the middle of the road suddenly shoots up in the air, and even more incredible their jeep suddenly follows the yellow line up into the sky. Driving high up into the clouds the lovers find themselves transported to another dimension where they are confronted by a massive giant. 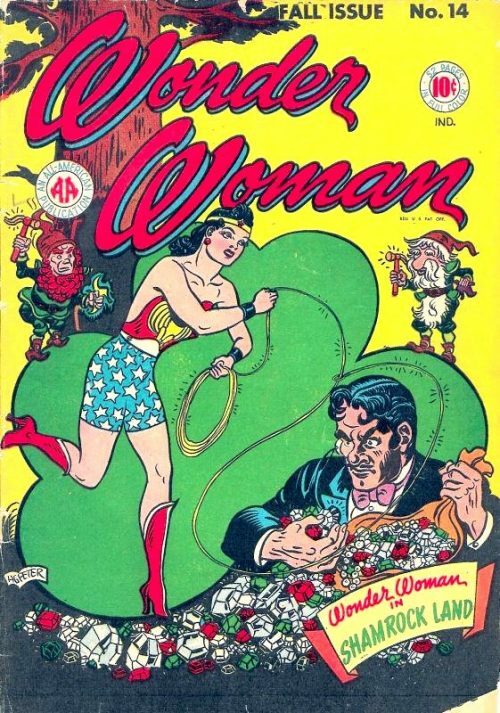 The giant explains that it’s race intends to invade the Earth, however it overheard Steve Trevor’s bold assertion that he could tell his girlfriend apart by a kiss, the creature offer them a challenge: Creating two duplicates of Wonder Woman, it tells Steve if he can guess which one is the real Wonder Woman, the giants will not invade the Earth. 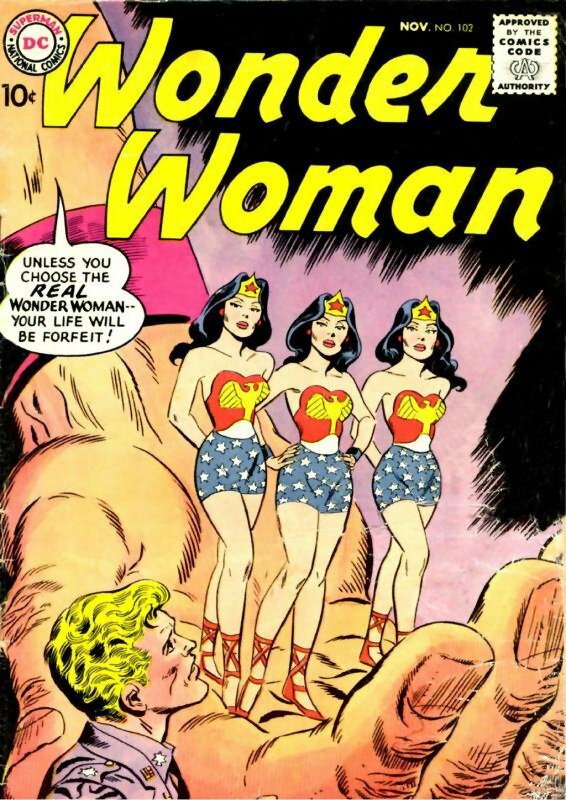 Presented with three Wonder Woman that look exactly the same, Steve Trevor is worried that he won’t be able to correctly guess which woman is really the woman he loves. The giant tells him that he has but one chance, but he can carry out any test he sees fit to make his decision. There is only one catch: None of the Wonder Women present can tell him if he is right or wrong. 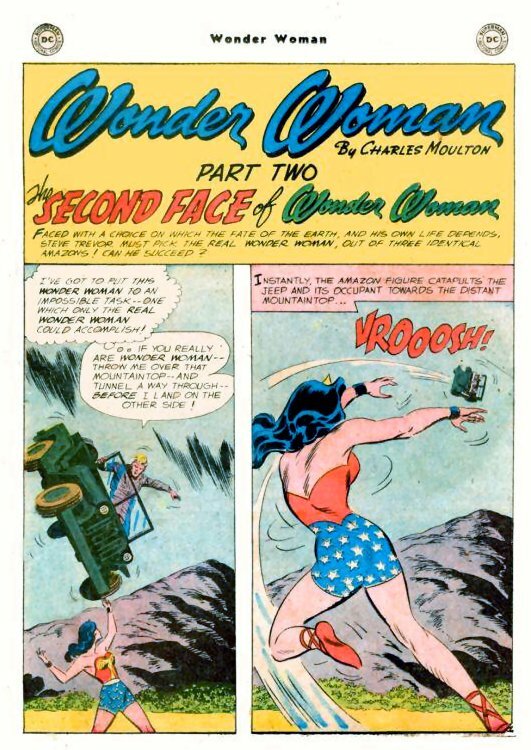 Taking one of the Wonder Women out for a ride in his jeep, she puts on a display of her strength by lifting up Steve’s jeep (with Steve still inside) and tossing it over a mountain, smashing through the mountain and catching the jeep on the other side before Steve can be harmed. 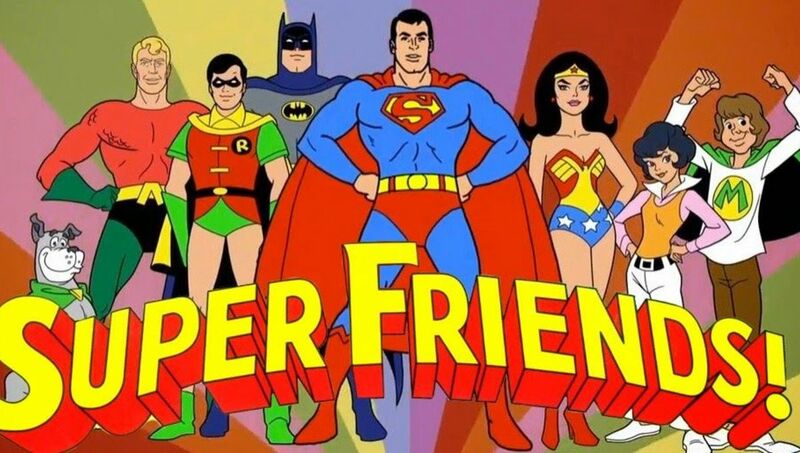 Impressed by this show of strength, Steve is almost convinced that this is the real Wonder Woman, but when he returns to the giant, he find that he still can’t make up his mind and so he takes the second Wonder Woman out on a test. Taking this second Wonder Woman out on a walk around the giants dimension, they remark on how different everything looks based form their scale. 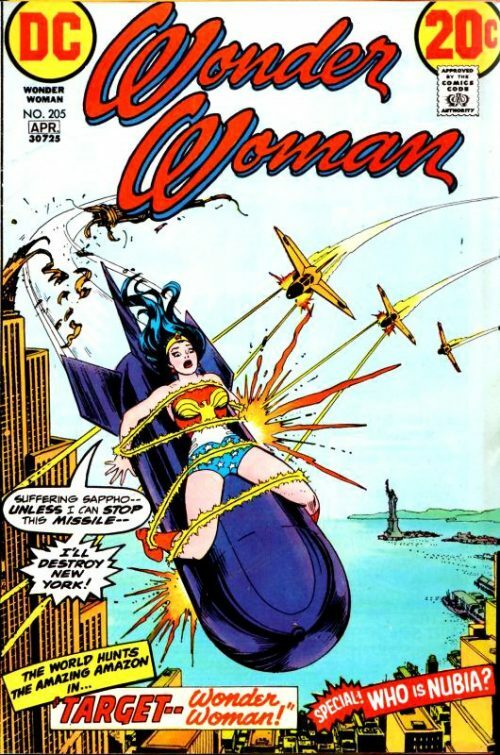 When a giant meteor threatens to destroy them, Wonder Woman uses a tree trunk to launch a rock up toward it smashing the meteor to bits. To save Steve from the flaming chunks of meteor she would use the same tree to bat the flaming bits of space rock out of the way. 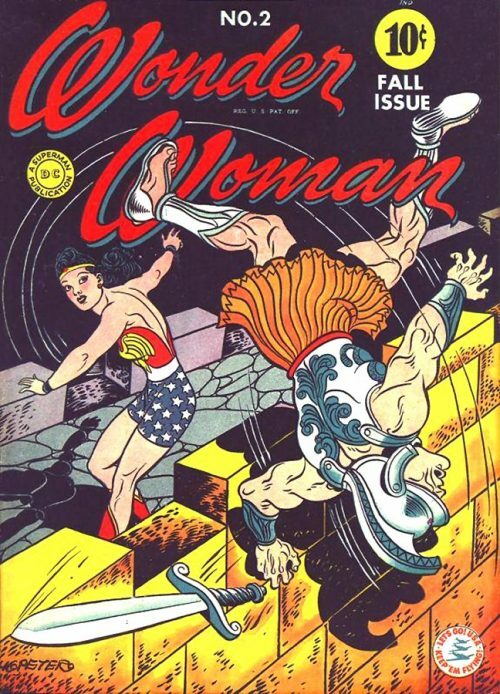 Once more almost certain that the woman before her was really Wonder Woman, he goes back and still finds that he cannot make up his mind and decides to test the third Wonder Woman. Taking her out, he would be surprised when she jumps in the way of a thunder bolt that is about to strike him. Coming across a missile the giants plan to use against the Earth, Steve has her use super-vibration to convert the missile into a needle. When she converts it to a needle the scale size for the giants of this world, Steve has her then shrink it down to human size. He then asks her to pass him through the eye of the needle: She complies by stretching it out in size so that he can pass through it easily. 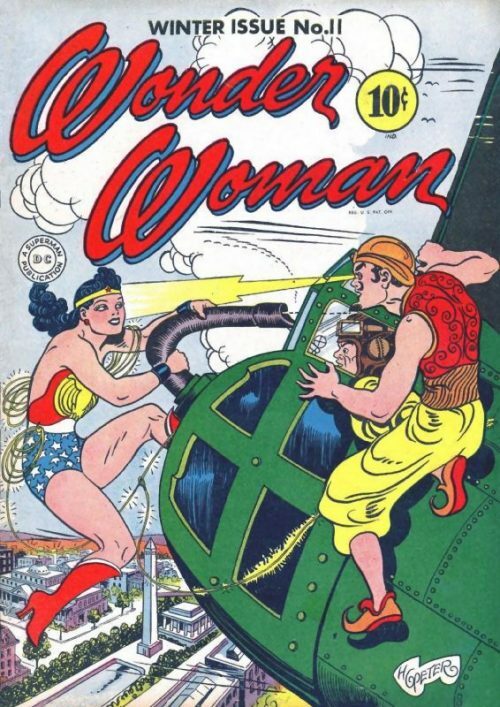 Still unconvinced that this third woman is the true Wonder Woman, Steve decides to do one more test: A kissing contest. After kissing all three Wonder Women, Steve picks one of them and it turns out to be the right one, the other two women exploding — revealing that they were really advanced robots. 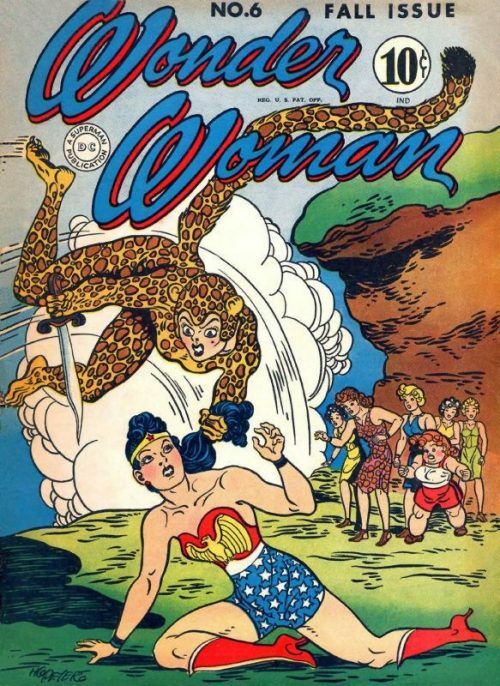 Believing that the humans have some sort of secret that could defeat the giants invasion, the giant agrees to give up their plans to attack the Earth and transports Steve and Wonder Woman back to Earth. 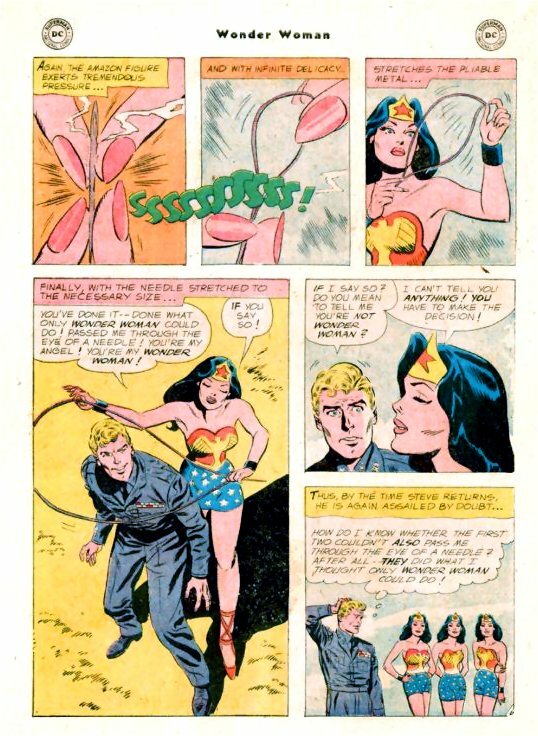 Although Steve saved the world from invasion, he’s in trouble with Wonder Woman, who says if he knew who was the real Wonder Woman, why did he kiss the two robots first and wonders if in another situation how many women he would kiss first before kissing her.